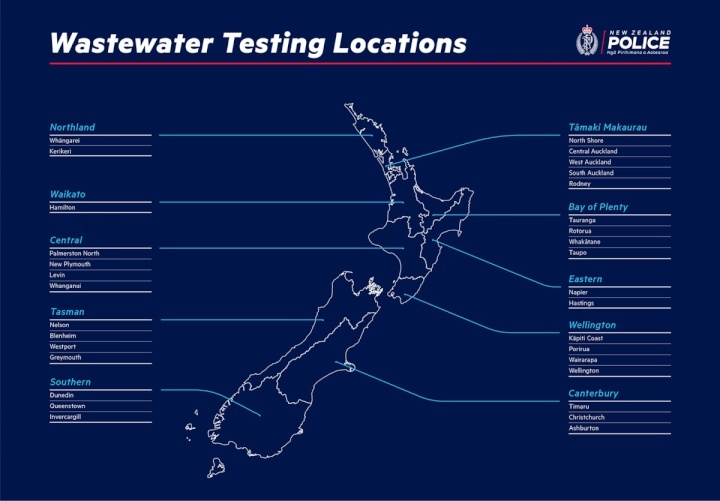 Testing will be rolled out to 38 sites across the 12 Police districts this month and will capture 80% of New Zealand’s population. Police Commissioner Mike Bush says wastewater testing is crucial to Police’s understanding of drug consumption in our communities. “Over the past 18 months, 1.5kg of methamphetamine was estimated to have been consumed on average each week across the three test sites. “Expanding the number of sample locations will help us identify differences in drug use between geographic regions and will act as an early warning system for emerging risks,” says Mr Bush. ESR Chief Executive, Keith McLea, says the organisation has extensive expertise in the science of wastewater testing. Cannabis will be introduced in Northland and across Tāmaki Makaurau, and ephedrine/pseudoephedrine will be introduced at all sites as part of the rollout. The four Tāmaki Makaurau sites began testing on 1 October with the rest of the country’s sites expected to be testing by the end of the month.